Whether they’re concerned about insider risks, compelled data disclosure demands, or other perceived dangers, some people prudently use end-to-end email encryption to limit the scope of systems they have to trust. The best-known method, PGP, has long been available in command-line form, as a plug-in for IMAP-based email clients, and it clumsily interoperates with Gmail by cut-and-paste. All these scenarios have demonstrated over 25 years that it’s too hard to use. Chromebook users also have never had a good solution; choosing between strong crypto and a strong endpoint device is unsatisfactory. These are some of the reasons we’ve continued working on the End-To-End research effort. One of the things we’ve done over the past year is add the resulting E2EMail code to GitHub: E2EMail is not a Google product, it’s now a fully community-driven open source project, to which passionate security engineers from across the industry have already contributed. E2EMail in its current incarnation uses a bare-bones central keyserver for testing, but the recent Key Transparency announcement is crucial to its further evolution. Key discovery and distribution lie at the heart of the usability challenges that OpenPGP implementations have faced. Key Transparency delivers a solid, scalable, and thus practical solution, replacing the problematic web-of-trust model traditionally used with PGP. We look forward to working alongside the community to integrate E2EMail with the Key Transparency server, and beyond. If you’re interested in delving deeper, check out the e2email-org/e2email repository on GitHub. What is a cryptographic hash collision? A collision occurs when two distinct pieces of data—a document, a binary, or a website’s certificate—hash to the same digest as shown above. In practice, collisions should never occur for secure hash functions. However if the hash algorithm has some flaws, as SHA-1 does, a well-funded attacker can craft a collision. The attacker could then use this collision to deceive systems that rely on hashes into accepting a malicious file in place of its benign counterpart. For example, two insurance contracts with drastically different terms. In 2013, Marc Stevens published a paper that outlined a theoretical approach to create a SHA-1 collision. 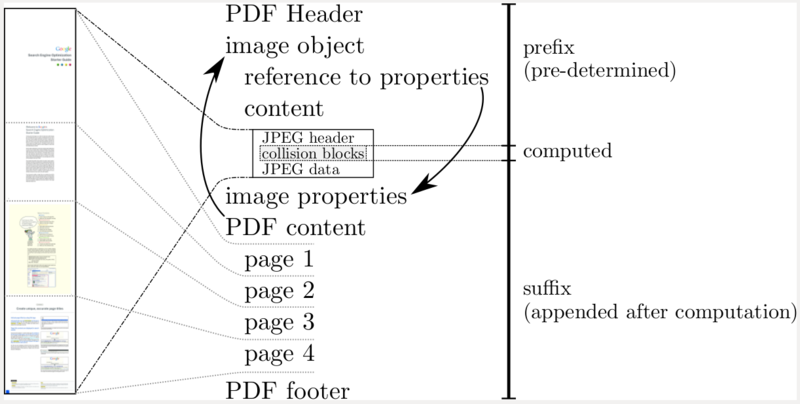 We started by creating a PDF prefix specifically crafted to allow us to generate two documents with arbitrary distinct visual contents, but that would hash to the same SHA-1 digest. In building this theoretical attack in practice we had to overcome some new challenges. We then leveraged Google’s technical expertise and cloud infrastructure to compute the collision which is one of the largest computations ever completed. While those numbers seem very large, the SHA-1 shattered attack is still more than 100,000 times faster than a brute force attack which remains impractical. Moving forward, it’s more urgent than ever for security practitioners to migrate to safer cryptographic hashes such as SHA-256 and SHA-3. Following Google’s vulnerability disclosure policy, we will wait 90 days before releasing code that allows anyone to create a pair of PDFs that hash to the same SHA-1 sum given two distinct images with some pre-conditions. In order to prevent this attack from active use, we’ve added protections for Gmail and GSuite users that detects our PDF collision technique. Furthermore, we are providing a free detection system to the public. You can find more details about the SHA-1 attack and detailed research outlining our techniques here. This result is the product of a long-term collaboration between the CWI institute and Google’s Research security, privacy and anti-abuse group. Marc Stevens and Elie Bursztein started collaborating on making Marc’s cryptanalytic attacks against SHA-1 practical using Google infrastructure. Ange Albertini developed the PDF attack, Pierre Karpman worked on the cryptanalysis and the GPU implementation, Yarik Markov took care of the distributed GPU code, Alex Petit Bianco implemented the collision detector to protect Google users and Clement Baisse oversaw the reliability of the computations. Existing mechanisms for file sharing are so fragmented that people waste time on multi-step copying and repackaging. With the new project Upspin, we aim to improve the situation by providing a global name space to name all your files. Given an Upspin name, a file can be shared securely, copied efficiently without "download" and "upload", and accessed by anyone with permission from anywhere with a network connection. Our target audience is personal users, families, or groups of friends. Although Upspin might have application in enterprise environments, we think that focusing on the consumer case enables easy-to-understand and easy-to-use sharing. Any user with appropriate permission can access the contents of this file by using Upspin services to evaluate the full path name, typically via a FUSE filesystem so that unmodified applications just work. Upspin names usually identify regular static files and directories, but may point to dynamic content generated by devices such as sensors or services. allows Joe and Mae to read any of the files in the directory holding the Access file, and also in its subdirectories. As well as limiting who can fetch bytes from the server, this access is enforced end-to-end cryptographically, so cleartext only resides on Upspin clients, and use of cloud storage does not extend the trust boundary. Upspin looks a bit like a global file system, but its real contribution is a set of interfaces, protocols, and components from which an information management system can be built, with properties such as security and access control suited to a modern, networked world. Upspin is not an "app" or a web service, but rather a suite of software components, intended to run in the network and on devices connected to it, that together provide a secure, modern information storage and sharing network. Upspin is a layer of infrastructure that other software and services can build on to facilitate secure access and sharing. This is an open source contribution, not a Google product. We have not yet integrated with the Key Transparency server, though we expect to eventually, and for now use a similar technique of securely publishing all key updates. File storage is inherently an archival medium without forward secrecy; loss of the user's encryption keys implies loss of content, though we do provide for key rotation. It’s early days, but we’re encouraged by the progress and look forward to feedback and contributions. To learn more, see the GitHub repository at upspin. We are constantly working to protect our users, and quickly adapt to new online threats. This work never stops: every minute, we prevent over 10 million unsafe or unwanted emails from reaching Gmail users and threatening them with malicious attachments that infect a user’s machine if opened, phishing messages asking for banking or account details, and omnipresent spam. A cornerstone of our defense is understanding the pulse of the email threat landscape. This awareness helps us to anticipate and react faster to emerging attacks. Today at RSA, we are sharing key insights about the diversity of threats to corporate Gmail inboxes. We’ve highlighted some of our key findings below; you can see our full presentation here. We’ve already incorporated these insights to help keep our G Suite users safe, and we hope that by exposing these nuances, security and abuse professionals everywhere can better understand their risk profile and customize their defenses accordingly. Attackers appear to choose targets based on multiple dimensions, such as the size and the type of the organization, its country of operation, and the organization’s sector of activity. Let’s look at an example of corporate users across businesses, nonprofits, government-related industries, and education services. If we consider business inboxes as a baseline, we find attackers are far more likely to target nonprofits with malware, while attackers are more likely to target businesses with phishing and spam. These nuances go all the way down to the granularity of country and industry type. This shows how security and abuse professionals must tailor defenses based on their personalized threat model, where no single corporate user faces the same attacks. Research like this enables us to better protect our users. We are constantly innovating to better protect our users, and we've already implemented these findings into our G Suite protections. Additionally, we have implemented and rolled out several features that help our users stay safe against these ever-evolving threats. The forefront of our defenses is a state-of-the-art email classifier that detects abusive messages with 99.9% accuracy. To protect yourself from unsafe websites, make sure to heed interstitial warnings that alert you of potential phishing and malware attacks. Use many layers of defense: we recommend using a security key enforcement (2-step verification) to thwart attackers from accessing your account in the event of a stolen password. To ensure your email contents’ stays safe and secure in transit, use our hosted S/MIME feature. Use our TLS encryption indicator, to ensure only the intended recipient can read your email. We will never stop working to keep our users and their inboxes secure. To learn more about how we protect Gmail, check out this YouTube video that summarizes the lessons we learned while protecting Gmail users through the years. We are constantly working to meet the needs of our enterprise customers, including enhanced security for their communications. Our aim is to offer a secure method to transport sensitive information despite insecure channels with email today and without compromising Gmail extensive protections for spam, phishing and malware. Client-side S/MIME has been around for many years. However, its adoption has been limited because it is difficult to deploy (end users have to manually install certificates to their email applications) and the underlying email service cannot efficiently protect against spam, malware and phishing because client-side S/MIME makes the email content opaque. With Google’s new hosted S/MIME solution, once an incoming encrypted email with S/MIME is received, it is stored using Google's encryption. This means that all normal processing of the email can happen, including extensive protections for spam/phishing/malware, admin services (such as vault retention, auditing and email routing rules), and high value end user features such as mail categorization, advanced search and Smart Reply. For the vast majority of emails, this is the safest solution - giving the benefit of strong authentication and encryption in transit - without losing the safety and features of Google's processing. Using hosted S/MIME provides an added layer of security compared to using SMTP over TLS to send emails. TLS only guarantees to the sender’s service that the first hop transmission is encrypted and to the recipient that the last hop was encrypted. But in practice, emails often take many hops (through forwarders, mailing lists, relays, appliances, etc). With hosted S/MIME, the message itself is encrypted. This facilitates secure transit all the way down to the recipient’s mailbox. S/MIME also adds verifiable account-level signatures authentication (versus only domain-based signature with DKIM). This means that email receivers can ensure that incoming email is actually from the sending account, not just a matching domain, and that the message has not been tampered with after it was sent. How to use hosted S/MIME? S/MIME requires every email address to have a suitable certificate attached to it. By default, Gmail requires the certificate to be from a publicly trusted root Certificate Authority (CA) which meets strong cryptographic standards. System administrators will have the option to lower these requirements for their domains. To use hosted S/MIME, companies need to upload their own certificates (with private keys) to Gmail, which can be done by end users via Gmail settings or by admins in bulk via the Gmail API. From there, using hosted S/MIME is a seamless experience for end users. When receiving a digitally signed message, Gmail automatically associates the public key with the contact of the sender. By default, Gmail automatically signs and encrypts outbound messages if there is a public S/MIME key available for the recipient. Although users have the option to manually remove encryption, admins can set up rules that override their action. Hosted S/MIME is supported on Gmail web/iOS/Android, on Inbox and on clients connected to the Gmail service via IMAP. Users can exchange signed and encrypted emails with recipients using hosted S/MIME or client-side S/MIME. Which companies should consider using hosted S/MIME? Hosted S/MIME provides a solution that is easy to manage for administrators and seamless for end users. Companies that want security in transit and digital signature/non-repudiation at the account level should consider using hosted S/MIME. This is a need for many companies working with sensitive/confidential information. Hosted S/MIME is available for G Suite Enterprise edition users. Despite constant advancements in online safety, phishing — one of the web’s oldest and simplest attacks — remains a tough challenge for the security community. Subtle tricks and good old-fashioned con-games can cause even the most security-conscious users to reveal their passwords or other personal information to fraudsters. This is why we’re excited about the news for G Suite customers: the launch of Security Key enforcement. Now, G Suite administrators can better protect their employees by enabling Two-Step Verification (2SV) using only Security Keys as the second factor, making this protection the norm rather than just an option. 2SV with only a Security Key offers the highest level of protection from phishing. Instead of entering a unique code as a second factor at sign-in, Security Keys send us cryptographic proof that users are on a legitimate Google site and that they have their Security Keys with them. Since most hijackers are remote, their efforts are thwarted because they cannot get physical possession of the Security Key. Users can also take advantage of new Bluetooth low energy (BLE) Security Key support, which makes using 2SV Security Key protection easier on mobile devices. BLE Security Keys, which work on both Android and iOS, improve upon the usability of other form factors. We’ve helped protect users from phishing for many years. We rolled out 2SV back in 2011, and later strengthened it in 2014 with the addition of Security Keys. These launches complement our many layers of phishing protections — Safe Browsing warnings, Gmail spam filters, and account sign-in challenges — as well as our work with industry groups like the FIDO Alliance and M3AAWG to develop standards and combat phishing across the industry. In the coming months, we’ll build on these protections and offer users the opportunity to further protect their personal Google Accounts.